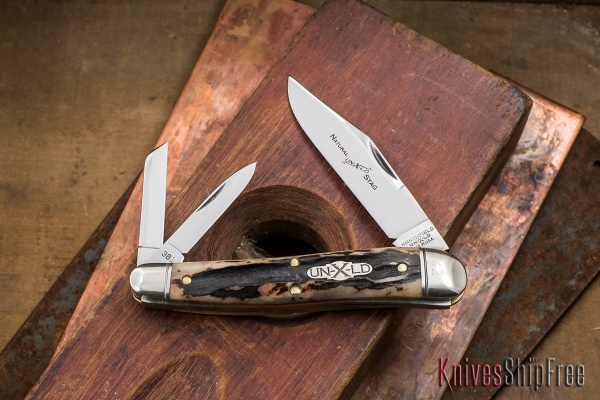 Here’s another look at the Great Eastern Cutlery #38 Grinling Whittler. Unlike the Tidioute we posted the other day, however, this one bears the Northfield UN-X-LD marque. And in place of Black Camel Bone, this one’s scaled in Burnt Stag. It’s a fine knife, either way, but let’s be honest — Stag is a star. This entry was posted in EDC, Great Eastern Cutlery, Traditional and tagged EDC, Great Eastern, Slipjoint, Stag. Bookmark the permalink.